I have lost count of the number of times I have been to Majorca, on holidays, escorting groups, conferences. The first time I went there over 40 years ago I stayed in the Torrenova Hotel escorting a group of pensioners. All those years ago there was no such thing a buffet service in the restaurants it was all waiter service. In fact at this hotel there was a glass cabinet outside the restaurant with numbered plates of food so you would know what your meal looked like when you ordered it. That all seems so funny now!!! I have just returned from a 3 night Conference at the Melia Calvia Beach Hotel, initially I did not know where this hotel was but then realised it was the old Antillas Sol in Magaluf! So I was most interested to see what all this was about. Well it was a delightful surprise the hotel has had a complete makeover, contemporary and modern now being part of the Melia group of hotels. We had an hour’s free time in between business sessions so I wandered down the promenade and the whole resort seems to have had a makeover and geared towards families rather than the Club scene. There is still the area that they call ‘The Strip’ where there are bars and clubs. At the end of the Conference my husband flew out to meet me and we had 4 nights in City of Palma. Staying at the Melia Palas Atenea Hotel which is along the seafront just outside the City. It is about a 20 minute stroll before you turn off and start to wander around the labyrinth of streets full of shops, bars and restaurants. We booked a Premium Room with a Sea View, this was a lovely big room with a small seating area and balcony overlooking the sea. This room also gave us access to The Level Lounge which is just amazing. You have to be in a Level room category to get access to this lounge, it does cost extra but if you are inclined to spend time in your hotel it is worth every penny. There are delicious little snacks throughout the day, sushi, fruits, a wide variety of meats, cakes, chocolates, sweets just so many things to eat or nibble. There are a couple of large fridges that are just full of every type of wine and one of my favourites Frexinet in pink, white and the new ice version. There was a wide choice of spirits, beers and soft drinks too. There was an area with tables to sit and eat but also lots of soft squashy big settees inside and an area to sit outside. I think this is possibly one of the best ‘Club Lounge’ with regards to what is offered that I have visited. If you like a drink I think it is well worth the extra. Palma is a great city with a great mix of cultural things to visit like the beautiful Cathederal. Lots of Designer shops as well as smaller independent shops. There are a myriad of restaurants of every type to eat in, we had to delicious meals at Ombu and Forn de Sant Joan which are part of a small group. We went to the famous Cocktail Bar Abaco in Palma, which is very special indeed. 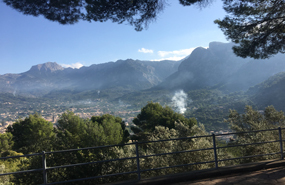 We had a day out on the fabulous train from Palma to Puerto Soller. 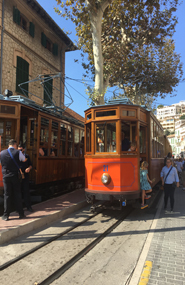 A super day out, it is best to buy your ticket to go or Port De Soller as this means you get the tram from Soller down to the port which is a lovely place for lunch. It is a delightful way to see the interior of the island and a nice break from the City. A lovely few days break in the sunshine, short flight, short transfer just what the Doctor ordered. I look forward to going back another time to visit one of my favourite cities.